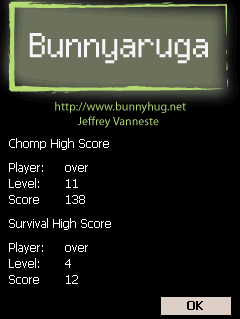 Bunnyaruga (bunny-ah-roo-gah) is a simple game that is essentially a merge of the game Escape and Ikaruga. It’s something you can play for a few minutes for a quick action game. The first few levels may seem really easy but to pass the higher levels it gets much more difficult. There are two game modes, chomp and survival. In both you tap and hold the shark and move the stylus around to move the shark. 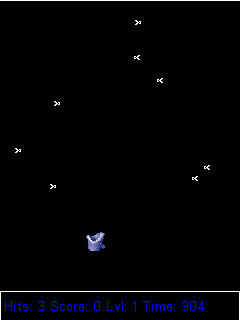 In survival your goal is dodge the fish. Each level more and more fish will get added making it more difficult to survive. In chomp your goal is to eat all the fish. A blue shark can eat blue fish and a white shark can eat the white fish. To switch the color of your shark press any button. If you want to quit at any time press any direction on the directional pad. I created Bunnyaruga for a Code Project challenge. 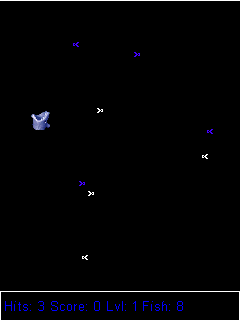 I wrote up an article showing an example of a game that uses the GAPI and Hekkus libraries. It also showed a nice and free way of deploying games/applications without requiring the .NET Framework installed on the end user machines.